The Confederated Tribes of the Umatilla Indian Reservation is made up of three tribes: the Umatilla, Cayuse, and Walla Walla tribes. 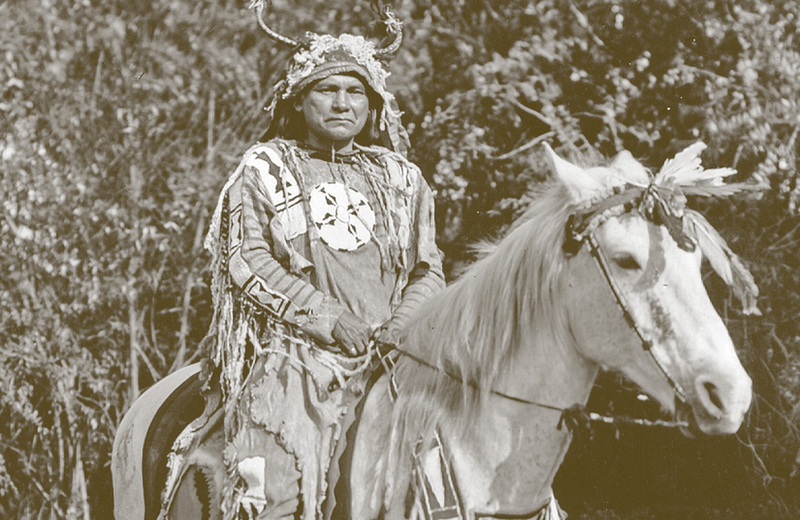 The Umatilla, Walla Walla, and Cayuse tribes were renowned for their horsemanship. Near the end of the nineteenth century, they had herds estimated at 15,000 to 20,000 horses. When the leaders of the three tribes signed a treaty with the United States in 1855, they ceded 6.4 million acres of homeland in what is now northeastern Oregon and southeastern Washington. The 172,000-acre Umatilla Indian Reservation, almost half of which is owned by non-Indians, includes significant portions of the Umatilla River watershed. Today the confederation, united under a single tribal government adopted in 1949, numbers over 2,800 members (2011). The Umatilla are governed by a Board of Trustees composed of nine members elected by the General Council. Tribal headquarters are located in Mission, just outside Pendleton, Oregon. The Umatilla River and Grande Ronde rivers have been the focus of the tribe’s fish restoration activities for more than a decade. Under the tribe’s leadership, salmon were reintroduced in the Umatilla River in the early 1980s. The tribe, along with the state of Oregon, operates egg-taking, spawning, and other propagation facilities that are helping restore salmon runs. The tribe successfully reintroduced chinook salmon to the Umatilla River after 70 years of extinction. 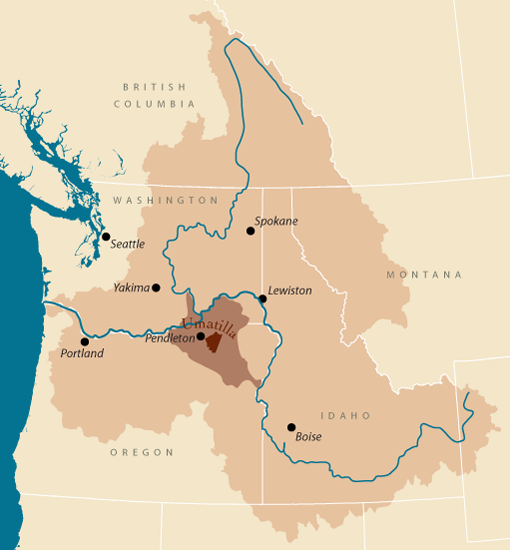 Other river basins in which the tribe has co-management responsibilities are the Columbia, Snake, Walla Walla, Tucannon, Grande Ronde, John Day, and Imnaha. In recent times, tribal fisheries have occurred only on the Umatilla and Columbia rivers. 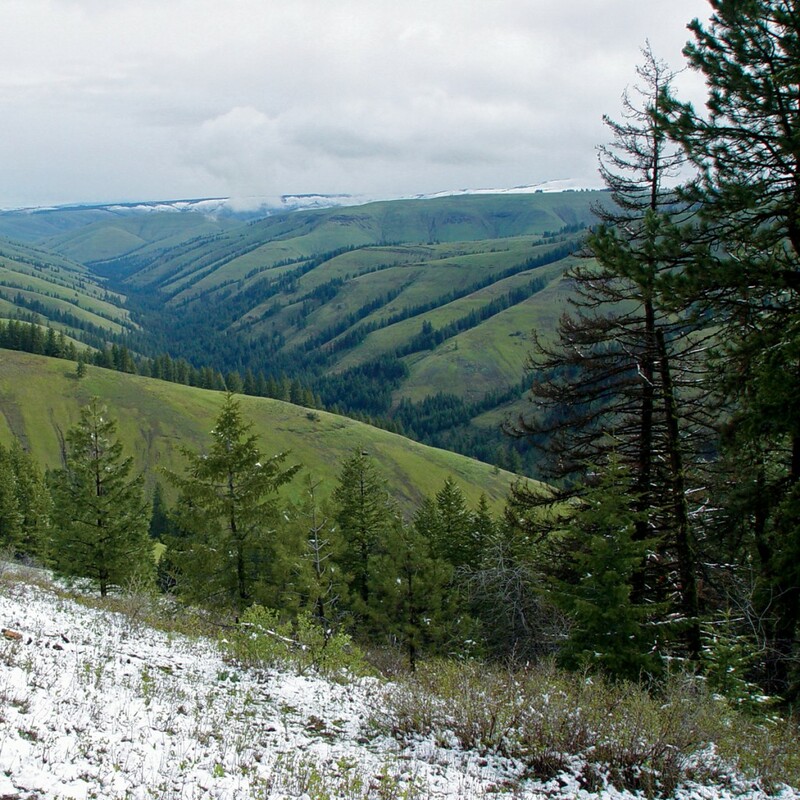 The Umatilla Tribe has been using PCSRF and BPA funds to acquire habitat in the Iskuulpa Creek watershed [pictured above] on the Umatilla Indian Reservation. The long-term project goal is to protect the watershed to provide spawning habitat for the threatened middle-Columbia River steelhead. The Iskuulpa watershed provides the highest summer steelhead spawning density observed in the 13 streams in the Umatilla Basin. The Umatilla reservation is dark red and the land they ceded to the United States is light red. The Columbia Basin is dark tan.